Let’s go Paris. We are so close. Let’s go. Let’s take the Chunnel and spend a day in Paris. I can’t be this close and not walk the streets and smell the cigarette smoke and pastry scents of the city. We’ll leave early in the morning on the train and we will both be enraged by the unceasingly noisy tourist group seated in the same car as we; their incessant geese-like cacophony driving us to the brink of madness. And what is that odor?! A metallic medicinal smell that will make both of us wrinkle our noses. The woman in front of us will eat seeds and toss the empty hulls on the tray in front of her. Unfortunately for us, she will sometimes miss and one or two will ricochet backwards and fall between our feet . I will be suffocated by their inability to comprehend personal space as their friends crowd around our seats to talk—shout – at each other, the harsh tones of their language neither mellifluous nor pleasing. When we exit the Eurostar train three hours later, Lan will meet us at the gate and you will finally meet my childhood friend, whom I have known since we were eight, who is like my fourth sister; a standing reinforced by the family gatherings to which she and Quang and Mia were invited when they lived in New York. And Lan will finally meet you. She was there with me six years ago when I wrote out that infamous list. We will take the RER one stop and walk to her flat, located on Boulevard Hausmann in the eighth arondissement. We will both laugh uproariously at the posted bill for the Steven Seagal concert. Did you know he could sing? Neither did I. As it is he can’t even act. I suppose he wishes to do a David Hasselhoff? Lan will be concerned that we haven’t got enough time to do anything. I will reassure her that our intent is simply to see her and to see Mia. Lan will want to take us to Sacre Coeur – but she and I will both notice that you are green around the gills; and you will ask to sit for a few minutes to rest while she and I run out to have lunch together. She and I will eat in the neighborhood. The bistro where she wishes to take me is too full to accommodate us, so we will make our way across the dirty, rough-hewn stone street to the other bistro. “I don’t know if this one is any good,” Lan will warn. I, confident that I have never eaten bad French food, will not be worried. A bavette with sauce l’échalotte for me please, and sangnant, with the pommes sautées. Lan will have the same but with a plate of vegetables s’il vous plaît. When my plate arrives, the potatoes will look wonderful; until I realize that they are mushing up, swimming in a pool of blood of a too rare (I never knew there is such a thing) steak, and oil. The shallot sauce is limp and purple, with no fragrance. I will be too appalled for words. When we return to the flat, you will be laid out in deep sleep on her couch, the victim of a bad cup of coffee picked up earlier that morning. And while we will be distressed for your illness, Lan and I will be too pleased to see each other and we will leave you to sleep while we trawl the city marveling that a year has passed since last I was here with her. 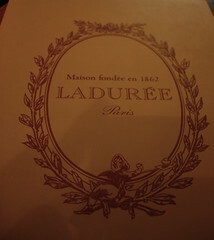 And I, having heard so much about these famous Ladurée macarons will be seduced by the notion. In the Ladurée store, a hungry horde swarms the counter demanding the pastel colored confections on the other side. We will go upstairs to the tea room, the dark wood paneled walls decorated with Empire wreaths and arrows, drawing light only from two large windows facing the avenue. Grande dames wrapped in couture and hauteur sit side by side with stylish and effortlessly chic young women. I will be the only tourist there as far as I can see; most of the others are situated firmly below purchasing macarons. What tea will we have? Enamored of the notes in my beloved Marco Polo tea, I will have the Thé a la Vanille and she will be more adventurous with her tea and select a smoky blend. Page after page of desserts will beckon to us but I am most interested in the Elysée which sounds like a large brick of chocolate – gananche, biscuit, mousse and glaze. 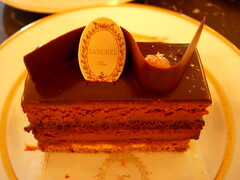 Lan will have the Millefeuille with rum pastry cream. And while we will adore our respective teas, the desserts are frighteningly sweet, lacking the subtle flair that made my experience at Fauchon so exquisite. “This is for women who like supermarket cakes,” Lan will note and I will laugh because she is right. Desserts are no good here. We will note that they are famous for their macarons. “There is a another place that has better macarons. It is called Pierre Hermé.” It is too short a day to make our way to Pierre Hermé so we resolve it do it another day. When we return you have slept off most of your illness and we will find a seat at that neighborhood bistro for dinner – how European to eat at 9:30! Foie gras! Foie gras! See there it will be on the menu! How the hell can you eat herring? And this bavette and pommes sautés with sauce poivre is as delicious here as the afternoon version at that other bistro was not. After dinner, we will wander the city together, Lan and I linked arm in arm; you and Mia side by side discussing the finer points of fish with teeth and what your favorite spiders are, her five year old hand dwarfed in your gentle mitt. There is Place de la Concorde and there is the Tuileries Gardens. And there, there in the distance you will see the clichéd and yet oh so lovely Eiffel Tower. Over there is Cleopatra’s Needle. And down this street – up ahead, that is the Opéra. And behind the Opéra is home. Thursday morning, before we depart, you will eat a real French baguette, crisp and warm. As Kaly once noted, it is “beyond redemption,” the day after it is made. But who has ever heard of leftover baguette? And on our journey back we will have two crisp baguettes stuffed with jambon and I will fall asleep on your shoulder until we arrive back in Waterloo station. Will you find that funny, too? That the Chunnel terminates in England at Waterloo? Let us go to Paris, you and I. Can’t we? Feh. Of all cities to come into on my way back to Paris, it has to be Cincinnati. Not that there’s anything wrong with Cincinnati. It’s just not as romantic as say…New York, or DC, or San Francisco. Another stellar meal from Delta, complete with ridiculous menu card and riddled with enough Eats-Shoots-&-Leaves typos, grammatical and stylistic errors to make copy editor wunderkind Colleen insane. There’s no sense in taunting them any further. If you can’t say something nice… I should follow Mom’s dictum (“…don’t say anything at all”) and not Alice Roosevelt’s (“…come sit next to me"). It’s always interesting coming back through U.S. customs. People speak to me really loudly or really slowly. When I answer in unaccented English, they look befuddled. Hey, I realize I look different, but the perfectly Caucasian woman in front of me is the one who can’t comprehend a word you’re telling her. And if she does, she’s pretending she doesn’t because she’s French. And the name on my passport – both my and Hubby’s surnames, is enough to induce momentary loss of speech. I love it. So being the efficient little geeklet that I am, I went and checked this out. And sure enough, even though the government raised the limit to $800 as a total value of what can be brought into the U.S. without being taxed, Customs permits only one liter of alcoholic beverages to be brought into the country. Of course, it’s up to the customs agent to determine how strict to get with you, but it appears they might be in agreement with me that such rule is completement et absolument stupide! cuz the guy let me through. Or maybe he took pity on me because he thought I was an imbecile for writing down how many bottles I was bringing back with me! Hubby and sister (Hustler of Culture) would avow it was Asian Booty Factor in play, but I was in jeans that were falling off me, a SupraMax nylon hoodie that did nothing to indicate I had a figure much less flatter one, hair going in ten thousand directions and no makeup. Oh yeah, I was also coughing like I have consumption and plan to die in a Paris attic surrounded by singing friends and my nose is bright red from blowing during the whole flight so I think I was evincing more Asian Flu than Asian Booty. But let’s say he was going to be a Swinging Richard. Well, in that case, he could have charged me 3% of the total value of goods for the first $1000 over the $800 limit (which I hadn’t hit) or he could tax me on each item as he saw fit. Now get this: you can bring in 200 cigarettes or 100 cigars and pollute my air but you can’t bring in more than a bottle of wine (which are usually 750 mL) or other alcohol. Does this seem Draconian and ridiculous to you, too? I must find an Transcontinental Underground Railroad for wine. All this time I’ve been complaining about living in the Buckle of the Bible Belt and not being able to have wine shipped here. Who knew my beautiful country has a Customs Office that forgot the 18th Amendment was repealed. One bottle? Can I say that again in total shock? ONE BOTTLE. I got some serious power sleeping in last night. Two blasts of steroidal nasal spray and a tumbler of Armagnac. I can’t drink hard liquor, no matter how much I try. I’ve tried for years to appreciate Cognac as my dad loves it so much but I just can’t. Alcohol that can destroy living organisms on its way down to my stomach is simply too burly for me. On the other hand, no sleep + sore throat = tired, cranky person who continues to pray for Cigar Man's painful death from cancer (it’s the least that can happen to him for depriving me of my ramen). Just before bed, I took a swig of the Armagnac. Jules, sitting across from me on the other guest bed, started laughing. Being the kind of friend who wishes to share the best, I breathed at her. Actually, I didn’t need serious lung power: the alcohol fumes singed her nostrils pretty quickly. So, deep sleep, breathing through my nose like an evolved being, and I’m fortified. I’m at the airport now, loving my Mac for every wireless fiber of its being. I was at the Duty Free store earlier to pick up a bottle of Pastis 51 for my siblings when I came across a cold fromage case. All that gorgeous cheese. I love stinky, runny, gooey cheeses. I can’t think of a better place to eat them than in France. And I can’t buy a damn one to eat on the plane in lieu of what is sure to be more crappy Delta food. See the headlines: International incident as woman pelted to death with pimento loaf by exasperated seat mate for bringing rancid cheese on board trans-Atlantic flight. I still can’t smell. Which means I still can’t taste. And if I can’t smell, I won’t be able to determine how mephitic a cheese is, and if I can’t taste, what’s the point? On the other hand, I finally succeeded in finding a couple of bottles of the Faiveley Mercurey to bring home to hubby. Found it at the same duty free store. What luck! Especially since Quang, Jules and I spent an hour last night walking around looking for it. I wish I hadn’t checked in my rolling suitcase. There were other Faiveley wines I wanted to pick up for Hubby but scoliosis is already setting in from the bag currently laden with the Pastis, a rather large hardback edition of the complete adventures of Le Petit Nicolas and other sundry items. Ah well. It appears a return flight to Paris is in order. I had my first experience with fresh ramen three years ago in San Francisco. Wendy took me to her favorite place. It was a stunning experience. Crisp noodles in a flavorful clear broth with thin slices of seasoned pork. Greg and Alice lived in Japan for seven years. He yearns for fresh ramen the way one yearns for a lost love. We are in perfect empathy with each other. Fresh ramen is hard to come by -- we're not talking udon. We're talking ramen. And no, we can't get it where we live. Fresh ramen noodles have nothing in common with the cheap, disgusting plastic packages you find in grocery stores. Fresh ramen noodles…well, it’s like having fresh pasta versus grocery brand dried noodles. Actually, it’s beyond that but since I’m only functioning at 20% tonight (and in all honesty, that’s probably about 10% less than the status quo), the words just aren’t coming to describe what fresh ramen means, what it tastes like, what it represents, what it’s supposed to be. Let me just say it again: FRESH. RAMEN. So. My nasal membranes are utterly destroyed from the cigar and the-blowing-nose-all-night-experience. I have lost my sense of smell – which means I have lost my sense of taste. See food geek spend last night in Paris with friends. See food geek’s friends take her to fresh ramen restaurant in Little Japan. See food geek’s inability to smell or taste fresh ramen. See food geek sob uncontrollably at dinner table. I’m in hell. The cigar experience yesterday has induced flu-like symptoms today. In addition, Jules and I only managed about two hours of sleep – she, suffering from transcontinental insomnia, and me, due to an inability to breathe. I feel like someone stuffed my head full of cotton today. It’s probably about as much brain as I’ve got anyway. I’m so exhausted and out of sorts I couldn’t even haggle with one of the booksellers along the Seine. I half-heartedly began by offering her €3 less than the price she’d marked. She beamed and said, “Ah non, ce n’est pas possible. C’est un livre nouveau. C’est un bon prix.” (Sorry, can’t; it’s a new book. That’s a good price). I took a breath and couldn’t bring myself to engage. I reached into my bag and gave her the asking price. She looked both stunned and disappointed. I think I let her down. Hubby text messaged me and asked if I was feeling better? I wrote back that I couldn’t even bargain with a street vendor. Mon Dieu, he answered. Now I know you’re sick. Too tired to do anything adventurous, Jules and I went to the Mariage Frères tea room and shop in the sixth arrondissement. In fact, it’s located down the street from Les Bouquinistes, where we had dinner the other night. The tea rooms are decorated in the French colonial style – rattan chairs, bamboo wood, large shutters, ceiling fans, and potted palm trees. Think Indochine and every Saigon-at-the-turn-of-century-under-French-rule-before-Dien-Bien-Phu movie you’ve ever seen. I’ve been the main store in Marais, but my new favorite is definitely this one in the sixth. It’s much quieter, and the window overlooks a lovely little street off the rue des Grand-Augustins. The servers and tea masters are all dressed in crisp, white linen suits with vests. Mariage Frères was founded in 1854 and is the oldest tea company in France. Tea came to France about 20 years before England made tea its national beverage. The French king, Louis XIV, was said to be quite fond of tea and one of Madame de Sevignés letters refers to the habit of adding milk to tea. The Mariage family has a storied lineage in dealing teas. Ancestors Nicolas and Pierre Mariage first traveled to Persia in the 1660s as part of a trade delegation under Louis XIV. It was they who initiated and signed trade agreements to deal in teas and spices for the French East India Company. In 1845, their descendents, Aimé and Auguste were still chief tea and spice dealers to the French court under the banner of Auguste Mariage & Compagnie. Nine years later, Aimé’s sons, Henry and Edouard, founded Mariage Frères. The company sells over 500 teas, and are well known for unique blends with romantic names like as Lu Yu, Thés des Poètes Solitaires (Tea of Solitary Poets) and Thé Sur le Nil (Tea on the Nile). Mariage Frères developed tea-infused jams in 1986. Made with lemon juice, sugar and pure tea, they come in yummy flavors like Marco Polo, Earl Grey, and Podréa, which we had this morning with a campagnète au grain (whole grain baguette). I haven’t found a purveyor Stateside for Marco Polo yet. Somehow I can’t bring myself to buy in the States either; it’s far less expensive in France (even with the horrible exchange rate) and I’m of the (biased) opinion it’s fresher here. Jules ordered the Thé des Impressionistes (Impressionist Tea) – a much lighter green tea base with floral notes, and I had Marco Polo. We also ordered a plate of sorbets, infused with three different Japanese-inspired teas. After incredibly fortifying tea and sympathy, we went downstairs to purchase teas and jams and other items to bring back. You can order the teas in distinctive little black tins with the yellow Mariage Frères emblem (the French do packaging incredibly well – everything is attractively put together), buy tea bags, or buy loose teas by the grams. I’m partial to the loose bags by grams because it’s more economical, but also because I can never bring myself to throw away empty tins and my house doesn’t need to become a pack rat’s dream. There’s something oddly soothing about watching the men behind the counter move quietly and confidently, efficiently measuring out your tea selection with old fashioned iron weights. Their process is as much a ritual as the tea service itself. Armed with a fresh supply of tea and jam, I’m ready to head back home and revisit my afternoon in Paris. Parisians love their dogs. Their furry friends accompany them everywhere, even into stores. At almost every café we’ve been to, there’s invariably a little dog patiently seated next to his owner. This one sat at the table in front of us at Deux Magots. He was infinitely more likeable and well-behaved then the subsequent table occupants (Cigar Man, who must get cancer and die). After we vacated our table at Deux Magots so I wouldn’t reach out and smack Cigar Man with my bottle of Badoit, Jules and I found a quiet table at Café de Flore. We passed a thoroughly enjoyable two hours talking about detours and road trips and where journeys have led us. We noted how glad we were to be in Paris and discussed some of the stranger quirks we’d noticed. For instance, we remembered at Café de Flore that you’re supposed to tip the person who maintains the bathroom at restaurants. (We felt so guilty as both of us forgot on our separate bio break runs that we made an especial final trip upstairs so we could tip the girl -- and also so I could steal more toilet paper to wipe my cigar-smoke-afflicted nose. I had a tissue blow apart in my hands during one particularly loud and violent sneeze). The table behind Jules had been vacated for not ten minutes when an older gentleman (in what had to be the hottest wool suit in the universe on what was already an uncomfortably warm day) sat down with his Bichon Frise. “Allez,” he said to his dog, patting his knee. The white furball jumped up in his lap and enthusiastically French kissed him. He was soon joined by the male equivalent of the batty old woman with a thousand cats: another impeccably dressed octogenarian with four dogs so small they defined “kick dog.” All four hopped up on the bench to join their master, snarl and preen at bit at the Bichon, and then, drink coffee from their owner’s cup. L’addition, s’il vous plaît et NOW! CHECK! NOW! NOW! First Cigar Man. Now Stupid Pet Tricks. Kill me. Kill me now. Jules and I planned to go to Versailles today. Neither of us had been and we’d always wanted to go, but had been thwarted by circumstance (or prior traveling companions). As it happens, we were not destined to go today either. We went to the Métro stop at Rue Madeleine. I taught Jules how to order two roundtrip train tickets to Versailles at the ticket booth. Tickets in hand, we turned and walked through the gates and realized that we were at the wrong train platform. We needed to take the 8 to Balard, not the 14 to Bibliothéque Fr. Mitterand. We turned around and exited. The woman at the ticket booth took pity on the two dumb Americainnes and gave us an exit ticket for the 8. She also gave us two sprigs of lilies, to commemorate the first of May. They were wrapped in plastic emblazoned with Je porte bonheur (I carry happiness). At Invalides, we headed towards Platform A to wait for our train, the RER (Réseau express régional) C, to Versailles. As we sat there, we noted an American couple who had been before us in the ticket line. They were either on their honeymoon or subject to the oneiric state of being in Paris because they spent much of their wait kissing and holding hands. I’m telling you, Paris is in a league of its own when it comes to romance. “Versailles is closed today. It’s a holiday for them,” said her boyfriend. “Some holiday this is for us,” she grumbled. “It’s Labor Day for them,” he answered. I shouldn’t probe that remark too sarcastically because there are French people whom I adore and I would not want to cast aspersions on their nationality but I have as awful a weakness for oxymorons as I do for puns. Let us leave it there. I watched as our American compatriots climbed the train for a forty-minute ride to a palace that was closed for the day. “Let’s go get our money back and figure out what to do next,” I said. We went to the information desk and explained our situation to two gendarmes who were guarding the exit. Apparently there was some sort of event above the Invalides stop and they were re-directing everyone to another exit. They told us to go back to the Madeleine exit and try to get our refund there. Why I couldn’t get a refund at Invalides is beyond me. “Oh [email protected]#$%^&*( this,” I said to Jules. “Let’s go to Montparnasse and get our refund later since we’ll have to stop off at Madeleine to go home anyway.” We went to take the 13 towards Montparnasse and ended back up on the 8 going the wrong way. Actually, the 8 was already the wrong train and we found ourselves back at Madeleine. “Don’t worry about it,” said Jules. “No, consider to whom you are talking,” I said, marching to the information desk. “Versailles is closed today,” I said to the woman behind the counter. “Ah oui, c’est le premier mai,” she answered. I told her we wanted to get a refund because Versailles was closed and we couldn’t go. Blood boiling. Danger Will Robinson, danger! Apparently I can speak French fluently when I’m sober, too. I just can’t remember any cuss words. “Vive la France!” I yelled, turning around and grabbing Jules. We exited topside and realized we’d been traveling back and forth underground for almost an hour. At about this time, a text message from Hubby came in: Drink a GREAT wine today. See, this is why I’m married to the man. He just knows. “Jules, let’s go to Montparnasse. There’s a café I’d like to visit.” We went back down into the Madeleine stop and proceeded to walk towards the platform entrance. And once again, we headed through the wrong turnstile. Or rather, Jules did. Jules turned around automatically and pushed her way back through the turnstile doors, wrecking them in the process. You know, I needed that laugh. Once I recovered myself enough not to pee in my pants, we headed towards the right transfer station. As we passed a trash can, Jules reached into her bag. “I don’t mean to be ungrateful, but I’m not carrying much happiness right now,” and trashed the lily bouquets. We calculated we spent an hour and a half wandering underground in the Metro, getting on the wrong trains repeatedly and backtracking. There’s an entire other story about getting there (“Jules, if someone grabs you, turn around and yell at the top of your lungs, “What the [email protected]#$%^ do you want?” and kick because it ain’t me grabbing you and you don’t know anyone in Paris. It’s better to be an ugly American than a mugged American.”), but I finally realized two particular quests: time at both Café Deux Magots and Café de Flore, in St-Germain-des-Prés. The oldest church in Paris is the St-Germain-des-Prés. It was built in 542. It served as a Benedictine abbey and burned during the French Revolution. Rebuilt in the 19th century, it is noted also for one of its original Romanesque belfries, the oldest in France. René Descartes (“I think therefore I am”) is buried there. Quite apt as the church faces Café Deux Magots, where the French existentialist movement was brought to life and argued by Sartre, de Beauvoir and others including Camus and Juliette Greco over cups of coffee. Hemingway and his fellow American ex-pats spent plenty of time there as well, as well as other notable intellectuals and artists of the time like Ford Madox Ford and Ezra Pound. Café de Flore is across the street, no less celebrated but much quieter. 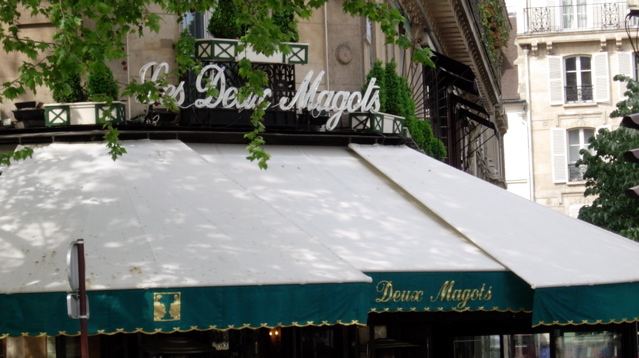 At Deux Magots, we ordered lunch, sparkling water and quiches. Clichéd? Touristy? $7 coffees? Sure. But worth every moment. Jules and I just sat back, drank our coffees and just admired the effortless style and manner of the French women (Jules: “My dogs are barking! How the hell do they walk around in those heels?”). So…drawback to Paris: the constant smoking. I can’t tell if it’s a blessing or curse that I live in a pristine world in which non-smokers are more prevalent than smokers. I have really sissy nasal passages that just can’t make nice with first or second hand smoke. I start dripping like a faucet. And the post nasal drip drainage – yay. So there I am enjoying an agreeable moment for the first time that day, and some jackass at the table in front of us lights up a stogie and starts blowing smoke in my face. He took a puff, turned around and exhaled, deliberately ignoring my and Jules’ horrified expressions and coughing. Cigarettes I can almost handle; cigars…well, even the Parisians around Cigar Man glared. My throat is killing me now from the constant drainage. I hope he gets cancer and dies. We paid our bill, got up, and walked across the street to Café de Flore, found another seat outside and had café crèmes and good conversation. I’m glad Jules was there. It’s good to have someone witness your life, but especially in Paris. Superb book. No nonsense. Common sense. But as I said to Jules tonight after a family dinner of osso buco, it only works if you’re not visiting Paris. We ate on the Rive Gauche last night. Lan tells me that the French don't refer to the embankments on either side of the Seine as geographic descriptors. "Left Bank" and "Right Bank" are terms apparently more American than French. They consider locations by arrondissements. After the mouse encounter at Fauchon, Jules and I headed off towards Les Bouquinistes, located in the Sixth (St-Germain-des-Prés), overlooking the Seine. It’s a lovely walk – past the Louvre and along the Seine, traversed by several ponts including the Pont Neuf, which we crossed to get to the restaurant. Les Bouquinistes is named for the booksellers who line the street on the left side of the Seine with stalls of second hand and antique books. Being a bibliowhore myself, I’m a little unnerved by displays of hand blocked prints which are obviously torn pages from books. Writing in books is one thing. Tearing books apart to sell the pictures piecemeal is an unnatural act. Twilight in Paris is a dusty blue; the river turns black and lights from the street glitter on the water’s surface. Brightly lit tourist barges occasionally destroy the serenity but they sail by quickly and the dusky colors settle on the Seine again. Along the river, couples are kissing, lost to the moment and to each other. It’s Robert Doisneau’s photo of the kiss at the hôtel de ville in situ. We think they’re French because we can’t imagine Americans being this openly passionate. Then again, we are in Paris. A dear dear dear friend once said with feeling, “It’s ironic to be in the city of love with a broken heart.” I think it’s the best time to be there: nowhere else is there such a clear affirmation of romance. Les Bouquinistes is one of five Guy Savoy restaurants in Paris. It’s high end, upscale, minimalist interior chic. There are restaurants similar to it in most of the major cities in the world. Not necessarily tourist friendly but foreigner accessible. In fact, we heard a lot of English on either side of us. Having already distended ourselves with our chocolate luxury two hours earlier, we weren’t too hungry. The menu featured seafood with one or two poultry dishes. Jules ordered the Thon "cru- cuit" en trois préparations, riz Basmati et sauvage aux herbes (Tuna Raw & Cooked, Three Styles with Basmati Rice and Wild Herbs) and I was torn between the Risotto crémeux au tourteau et langoustines rôties, bouillon de crustacés (Risotto with Roasted Prawns and Crab in a Seafood Broth) and the Sauces D’Asperges au langoustines rôties (Roasted Prawns in Asparagus Sauce). Ultimately, my deep affection for risotto won out (I just can’t say no to a carbohydrate). I wanted a glass of wine, but I don’t know how to read French wine menus; unlike American wines, which are classified by varietals, French wine menus appear to be arranged by terroir and region. I asked our waiter to select a wine for me. “Red or white?” he asked. He nodded confidently and brought me a glass of 2002 Faiveley Mercurey Clos Rochette (a white Burgundy). Mercurey is an appellation in Burgundy and the Clos Rochette is a chardonnay varietal. The very first white burgundy I ever drank was in 1992 – an Olivier LeFlaive St. Aubin. That St. Aubin still ranks as one of the best white wines I’ve ever had (and I don’t generally like white wines; Hubby says I love wines so tannic they’ll strip enamel off your teeth). The Mercurey reminded me about everything I’d love about that LeFlaive: round, crisp, with a soft floral note and pear finish. Perfect with any seafood dish, our waiter told me. If you think it’s funny that I wrote down the names of our dinner dishes, consider that I blinded half the people on our side of the restaurant with the camera’s flash when I took this picture of my dish (I was too chicken to repeat and take a picture of Jules’ plate). I’ve eaten at countless restaurants like this. They do lovely, elegant dishes that are often quite good, but usually lack depth or finish – seldom does flavor linger on the palate or in the memory. What came to our table was one of the most exquisite flavors I’ve ever tasted. The rice itself was a little softer than I like my risottos to be and the prawns were about 2 minutes from being mushy – but the broth was breathtaking: aromatic, savory, intense, with a chardonnay base and tasting of the sea. The spices were incredibly subtle; nothing pushed forward aggressively, but together formed a luscious mouthful. No offense to Jules, but paired with my wine, I really didn’t want to talk; I just wanted to roll that remarkable flavor on my tongue over and over again. I should have asked for the broth to go. Jules loved her dish – a tuna ceviche, a seared tuna belly, and two deep fried tuna spring rolls. Not being a fan of tuna, I ate one bite and politely acknowledged its serviceable preparation. I was too convinced of my risotto’s inherent superiority. Before she ate any part of her dish, I gave her a spoonful of my risotto. She made noises that drew second glances from men on either side of us. We had the best service we’ve had since we came to Paris. And no wonder, as service n’est pas compris at the restaurant. In France, a 15% tip and tax are generally included in the bill. Lan tells me that most servers are on salary and can’t really be fired so many of them don’t really try because they’re already getting their tip. Compared to eighteen years ago, “service” in the France has definitely improved…I remember eating with Tata Michelle in 1987 at Maître Kanter near Grenoble and having our waiter tell her he wasn’t interested in explaining what specials were available that day. In any case, Alexandre, our waiter, was attentive without being annoying and very helpful – important since his tip depended not on the “compris” or “tip included” ‘system, but on service. I can’t believe I’m so blasé about mediocre service now that I was enthralled with being treated like a customer. But I’ll take indifferent service for superb cuisine any day of the week. Except from Soto in Atlanta. That’s a different gripe. …This is why I come to Paris. To be happy. As it turns out, Lan and Quang live four blocks away from Fauchon’s flagship store at 30 Place de Madeleine. Fauchon is a high end gourmet store, a French version of Dean and Deluca (or maybe the reverse that Dean and Deluca’s is an American version of Fauchon?). Fauchon was founded in 1886 by Auguste Félix Fauchon, a grocer from Normandy. Fauchon learned about the “chain” store concept from Félix Potin, to whom he was apprenticed. He started with a small vending cart on the Place de la Madeleine in 1885 and opened his first store a year later, as a purveyor of fine foods and gourmet items. After his death in 1938, the business was taken over by his sons, who later sold the business to business man Joseph Pilosoff. Under Pilosoff’s tenure, Fauchon expanded to include international items, and after his death, ownership passed to his heirs. Fauchon was acquired by a private investment group in 1998 and there are now over 600 stores internationally. Per Wendy’s instructions, Jules and I headed over to the store to partake of the truffle omelet and to buy lobster butter. Upstairs in salon de thé, Blondine, our hostess, explained that they served the omelet only during lunch, but suggested some pastries with tea instead. It was 6:00 and we had dinner reservations at Les Bouquinistes, one of Guy Savoy’s restaurants, at 9:30, but I have no problem beginning with dessert. Jules ordered the green tea with orange blossoms and I had the mélange Fauchon, a black tea with raspberries, lavendar, and vanilla. We also ordered a half bottle of the house champagne. Our dessert selection was vanilla meringue enveloped in a thick dome of Gianduja ganache, textured with chocolate spray (achieved using a paint sprayer with melted chocolate), and dotted with chocolate meringue. Okay, see that little brown square embedded in the dessert? It was inscribed with “Fauchon” in gold lettering. As Jules asked me about my birthday evening with Hubby, I popped what I assumed to be a chocolate square in my mouth. “Hold on,” I said, gagging. “I’m eating cardboard.” I removed the sodden, teeth-marked piece of paper from my mouth and stared at it in horror. Apart from this grotesque pastry trompe l’oeil, dessert was an exquisite play in contrasts. The ganache was just creamy enough to be rich instead of heavy, and the chocolate fine enough to be subtle and not sugary. The meringue provided a satisfying “crunch” to an otherwise smooth and lush mouthful of chocolate. In between bouts of admiring our view (“We’re in Paris!”) and consuming a zillion calories, we were catching up when Jules suddenly reared back and gasped. I turned to watch a furry little grey body scurry towards the back of the room. As we were the only two people in the salon, it was easy to spot Mr. Mouse’s trajectory throughout the restaurant. “I’d rather see that than a cockroach,” I said. “I’m thinking there’s not much difference,” Jules answered, gritting her teeth. Since I was facing the opposite direction, I could not see Mr. Mouse’s second run at us, but Jules began to sound like Beaker when confronted with an experiment about to blow up in his face. When Jules is panicked, she also begins flapping her hands in front of her face violently, resembling an illiterate sign language speed demon. You know, I try hard, but sometimes, I’m just not as good a friend as I should be. I began snorting and laughing. At this point, a waiter walked into the room bearing a tray. “Excusez-moi, il y’a une souris là bas,” I told him, pointing at the mouse who was taking a break in the middle of the aisle, likely tired from his divebombing runs at Jules. He put the tray down and ran towards where I was pointing. “Oui je la voies.” He came back towards our table. Jules began swigging from her champagne glass. Then he walked away. The French do nonchalance so well. “No, dammit, I’m going to maintain my dignity and walk out.” (Bear in mind her feet are still planted on the seat at the table next to us). "Okay, okay. I can do this. You ate cardboard, I saw a mouse. This will just be something you'll put in your blog." Oh, and Wendy, we did go downstairs to the store and look for the lobster butter, but there was none. And Jules said that if I want the omelet and lobster butter today, I'm going to have to go by myself. Maybe la petite souris will join me again.